If you want to use the same photo multiple times across your website or blog, there’s no need to upload it multiple times to your WordPress install. If you haven’t already uploaded the file you’d like to use, you can learn how to do so here. Once you’ve got your file uploaded to WP, you can then use it on any page by clicking the Add Media button again on the page in question. Use the dropdown menu to choose All media items. Now you’ll see all of the images and other files which have ever been uploaded to your installation of WordPress. You can use the Date dropdown or the search box to refine things further, or just scroll through until you see the photo you’d like to use. Firstly, in this day and age of responsive design, the RICG Responsive Images plugin is a must. It automatically adds code to your site, both that inserted via this method and those that use calls like the_post_thumbnail() in your theme to make sure that different devices are being given the right sized image. How to upload an image to WordPress and get its URL to use anywhere on the web. How to use the original, high quality photo you’ve uploaded to WordPress. 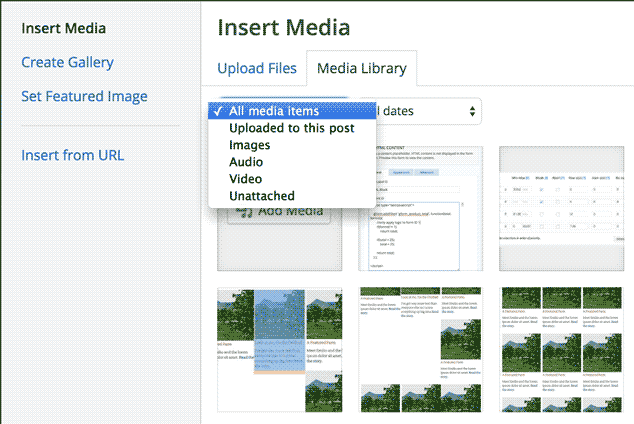 How to use the WordPress media uploader in general. How to upload and link to documents (other than images) to WordPress.